About 40 percent of people over the age of 65 have at least one disability, according to the United States Census Bureau, with about 15.7 million of these people suffering from mobility issues. Many feel confined, forced to stay home, eventually succumbing to feelings of isolation. This sort of pervasive isolation later in life can trigger bouts of depression and sadness. Thankfully, gardens can be therapeutic, with horticulture therapy being used in different forms of rehabilitation. Even though indoor and outdoor plants share similar elements, the unique outdoor setting of a garden has a unique effect. The garden setting inadvertently honors our primal baselines, as we are creatures that evolved in an environment intrinsic to nature. There is research proposing that there is an automatic, even subconscious reaction to nature. These therapeutic gardens offer sensory stimulation to dementia patients. In a randomized controlled study, even the sites of murals depicting nature accompanied by natural sounds have been noted to reduce discomfort. Many gardens tend to be inaccessible to those with mobility aids. However, there are certain things that your family or your assisted living facility can do to ensure that it is accessible to everyone. The Layout of the Garden Install several seats in the garden, under shaded areas. Gardens can be stimulating, with shady areas tempering the possibility for over-stimulation. If you have a large lawn, make sure that corners and headways have a curvature instead of straight lines. This will make it more accessible to those with mobility aids. Not only that, but this will help with maintenance, as you will not be required to maintain hard corners with specialized pruning tools. Instead of a pond that can pose a potential danger, use a low maintenance water feature to bring the visual interest of a pond without the heavy maintenance. 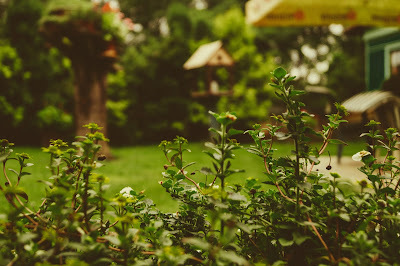 Have Several Quiet Spaces Throughout the Garden Some people who are experiencing cognitive impairments may need the occasional quiet time to recollect. Designated quiet areas will ensure that everyone stays comfortable during an excursion. These areas should be shaded, with simple landscaping and away from working areas and potential sources of sound. Install Kneelers The aging population may not feel comfortable bending for an extended period. Kneelers are ground-level beds that are raised. Make Tools Accessible Keep tools in a consistent location to help everyone remember where they go. This could be a designated shed for hand tools and garden materials. Use brightly colored tape to help misplaced tools, with long handled tools helping to ensure that no one overexerts themselves. If you are creating a community garden for the public, use a survey to decipher what the community wants and needs. A survey can help to ensure that the garden is accessible. Encourage the community to visit the garden by showing your willingness to adopt to disabled visitors.